While we send off a few marathoners north to run their races (Good luck to Judi, Lee, and Rich running the Smuttynose Marathon and Tall Dave running the Maine Marathon!) those running mid-October races start their taper this week. 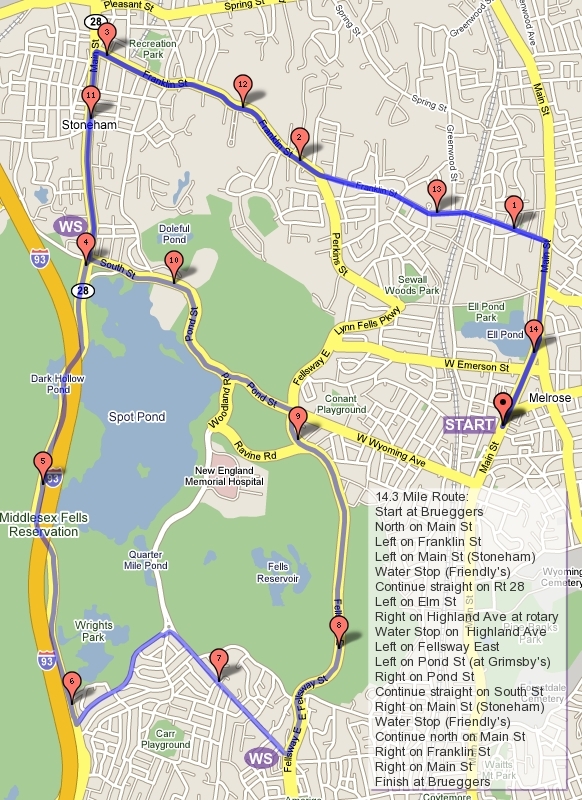 We’ll be running a figure 8 route this week, starting up East Foster to Melrose Common and over to Swains Pond. As we come out to Lebanon St we’ll go right, then left at the lights onto Forest St to the first water stop at Citizens Bank on Main St in Malden. From their we’ll head out Winter St to Greenwood St (straight across a big intersection by the Oak Grove T Station). Greenwood takes out to the rotary on the Fellsway East. Take a right onto the Fellsway and follow it to LynnFells Parkway to the knoll by Melrose High School for water stop 2. Continuing on the LynnFells Parkway we’ll go out to Main St in Saugus where we turn left. Roll through the hills to Farm St and turn left on Nahant St which will take you to water stop 3 at Nick’s Pizza on Main St in Wakefield. Three miles back along Main St will finish you up at Brueggers! Three water stops this week can be handled by 2 or 3 people. If there is a person manning a stop they can cover 1 and 3 easily. If someone wants to leave their car at the knoll I can pick them up and fill their trunk with supplies. Volunteers? Who’s in for this one? Roll Call! Week 12 – The Looong One! So this week we have 22 miles to run. I’m back and ready to go! Well, not so ready, but we’ll do it anyway. For those running mid-October marathons, this is your last big practice before the big day. Test out as much of race day as you can, starting with sleeping habits (he says typing this at 2AM), your meals, your clothes, your socks and shoes, your mid-run snacks and drinking. Figure out what works and what doesn’t now while you still have a chance to screw it up a little off the clock. The run will be very similar to the 20 miler… with 2 extra miles thrown in there. We’ll do it a little backward though, starting out by heading up Main to the Lynn Fells, out the Fellsway East to Highland Ave to the first water stop. Then we’ll run the back side of Spot Pond, turn at Friendly’s and head over to Eugene St for the second water stop. This was all the end of the 20 mile run, the part we staggered through on a hot muggy day. This time we get this part over with first. After Eugene we go down to Highland Ave in Winchester, running to the end and water stop 3. From there we head through West Medford to the Mystic Lakes, along the Mystic Valley Parkway to water stop 4. Leaving that stop we head back Washington St to Forest St and back to Eugene… just like in the 20 miler. From Eugene we head over by the Stone Zoo and down to Grimsby’s, taking a left to hit the Lynn Fells hill, back to Main and back to Brueggers to finish up. That’s it! Six short runs and we’re done. Water stop to water stop, that’s all you need to do. Speaking of water stops, there’s 4 spots to cover this week. Volunteers are needed in the form of cars parked, people to pick them up, or travelling manned stops. Let me know who can help and how and we’ll post a plan tomorrow night. Also let me know if you have supplies and how many stops you think you could support. I think I have enough for one or two right now. Who’s in and who’s helping?! ROLL CALL!!! This week is both the Victorian Fair and Lake Winnie Relay. There will still be a Sunday Run but many regulars will be missing. Start early, getting in a pre-8AM 6 miles in. Time it so you get back to Brueggers around 8AM. From there head up to Lake Quannapowitt, do a lap around, and then head back to Melrose for 16+. If you want a shorter distance, run the 10 to the lake. As far as water stops go, Â Brian Walfield kept the supplies from last week. If he can meet people at 8AM at Brueggers and give them water, then head out to Nick’s Pizza and hit them again on the way out and back, that should give you three water stops. Brian, if you want to run you have the Lake section to do. When you get back to Brueggers, grab your breakfast and coffee and go find Brian Slater and see if he needs a hand with the EMARC 5K Race at the fair. I’ll be up at Lake Winnie Sunday but may pop by the run/race when I get back. It’s Labor Day Weekend. Labor is defined by the Free Dictionary as: Physical or mental exertion, especially when difficult or exhausting. Given that, what better way to celebrate Labor Day than to run 20 Miles with your friends! Run 1: This week we’ll start from Brueggers of course and head out West Wyoming, past the Stone Zoo, past Friendly’s to Park St. A left on Marble St will bring us over Rt93 to Forest St in Winchester where we’ll stop for water. Run 2: From there we’ll continue to Highland Ave, follow that to the end and get some more water. Run 3: Taking Rt38 over to Playstead Rd where we turn right along Oak Grove Cemetery, we’ll head into West Medford. Turn right on RT60/High St, over the railroad tracks, past the Dunkin Donuts (a good place to take a potty break if needed). High Street will take you to the edge of Medford, where you’ll see Arlington across the river. As you’re running High St be careful NOT to veer right at a fork in the road at Grove St, STAY ON HIGH ST. At the river there will be a little rotary, this is where you turn right on Mystic Valley Parkway and run along the Mystic Lakes. If you run along the left side of the road you’ll find a path to run on, giving your feet a break from the concrete and asphalt. At the end of this street you’ll turn right, go under the train tracks and up to a park where you turn left, keeping on Mystic Valley Parkway. There is a paved path in this park you can run which will bring you up to water stop 3 near Winchester Center. Run 4: Next you run up to Washington St, turn left and follow Washington through a f way intersection. We’ve been here before, but it is a bit confusing. You want to cross through the intersection and stay on the street to the right on the other side. This is still Washington St. Run up past a church and through Winchester to the Gingerbread Construction Company. Don’t stop for breakfast, instead turn right up Forest St, up to the top where you’ll hit the first water stop again. Run 5: You’ve done this run before… cross over 93, turn right on Park St, over to Friendly’s again and right on Main St in Stoneham. Run the back side of Spot Pond past the Sheepfold over to Elm St. Left on Elm and up, up up to the rotary at Highland Ave. Turn right at the Mobil Station onto Highland and find the water stop there. Run 6: The last run of the day is one you’ve run in the other direction many times. Follow Highland Ave all the way to the rotary where the paper boy sits. Turn left onto the Fellsway East and cruise through the final hills of the day. When you get to Grimsby’s be glad you’re turning right, a flat last mile down West Wyoming to Main ending at a chair on a sidewalk in front of Brueggers. Yay! Another tip before I end this long post… This is the perfect chance to dry run your marathon day. Choose clothes appropriate for this weekend’s weather, but try to wear as much of your race day clothes as possible. The right shoes, socks, bra, underwear, shorts, and shirt are hard to find. Today you can learn what chafes and blisters you before you get out on the race course. Also test our your marathon meals. Dinner Saturday night and breakfast Sunday morning are key to how you run. Try your meals out today and see how they work tomorrow. Again better to find out that certain thing you think will work doesn’t when you’re running your 20 than when you’re running your marathon. OK, enough from me. I need three or four water stop volunteers. I’ll by some supplies and pass them out at Brueggers before the run. If you’re running short and starting somewhere else, consider letting us use your car. I think Dave and BrianW will be out on the course for us keeping us well. If so two more cars will make things work out well. One at Eugene, one at the last stop. Then those two can move around and help us out. Let me know and THANKS in advance! Who’s in for 20, or something else?! ROLL CALL!!! !